Spring is here! That means it is time to enjoy all the delicious spring vegetables and get outside. 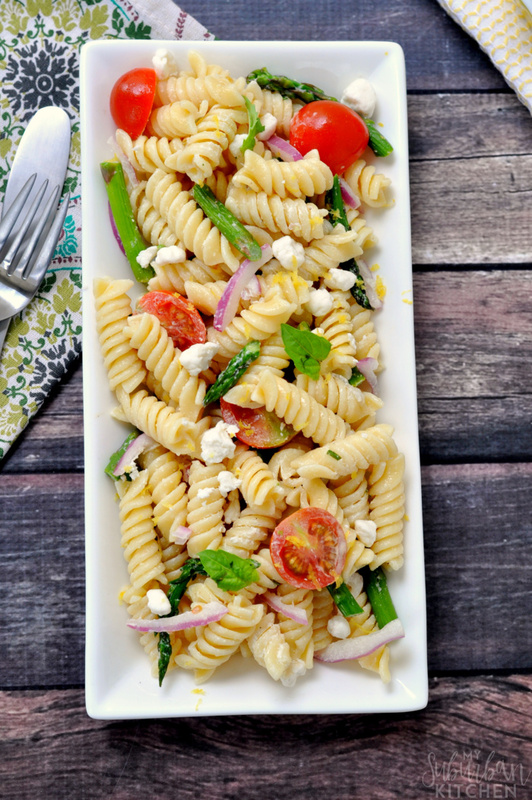 Why not combine the two and take a picnic with a bowl of roasted asparagus pasta salad in your basket? 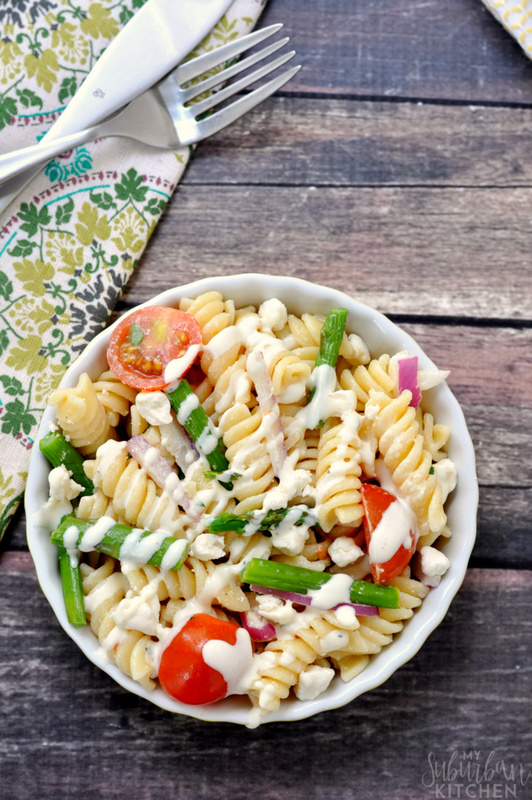 Seriously, this pasta salad is what picnic dreams are made of and you are going to love it. Asparagus is one of my favorite vegetables and something magical happens when you roast it in the oven for a few minutes. It becomes so ridiculously good that I could sit there and eat the whole pan. 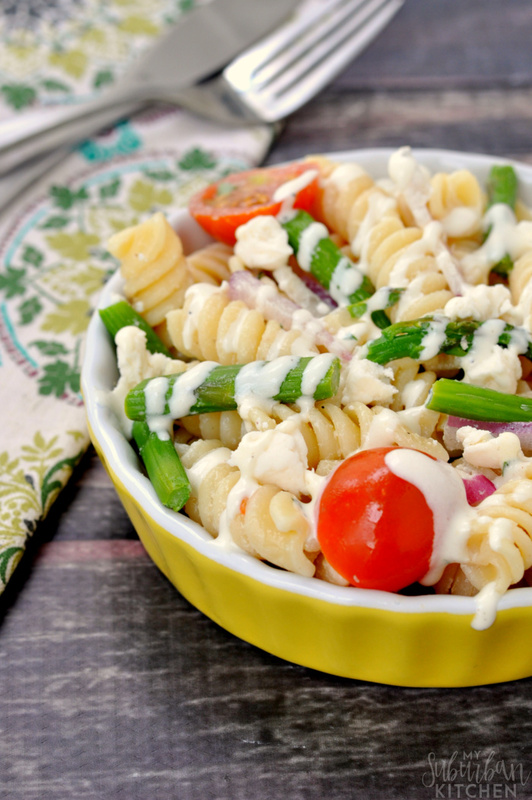 This time I am going to share though and toss into the perfect pasta salad. Cook pasta according to package instructions for al dente. Drain and rinse with cold water. Preheat oven to 400 degrees. Line a baking sheet with foil. Toss asparagus pieces with olive oil and spread on baking sheet. Sprinkle with salt. Roast in oven for 5 minutes. Remove from oven and cool. 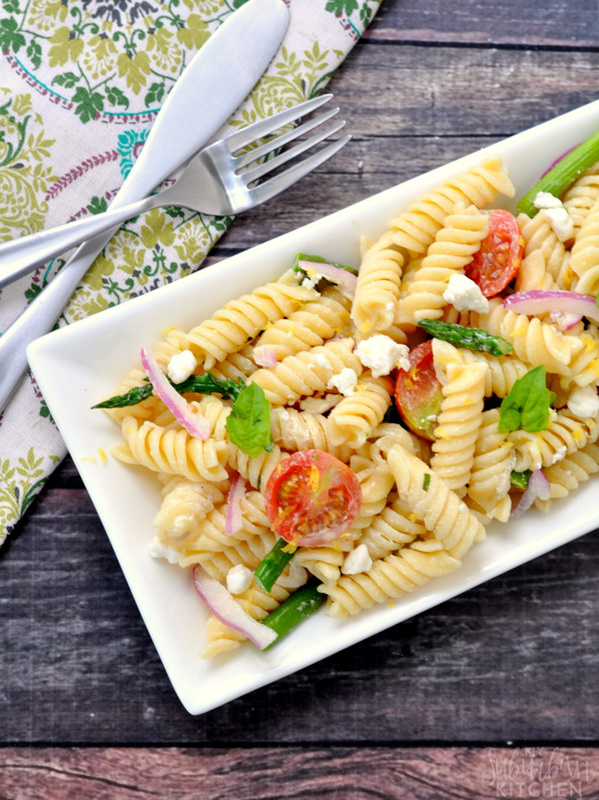 In a large bowl, combine pasta, asparagus and onion. In a medium bowl, whisk together yogurt, mayonnaise, mustard, lemon juice, olive oil, parsley and lemon zest. Pour oven pasta mixture and toss to combine. Refrigerate for at least 15 minutes. Before serving, stir in goat cheese. I am actually having some of this pasta salad for lunch and it is so good. It is perfect for making ahead if you are heading on a picnic or to a BBQ because it holds up really well. You could also toss in some grilled chicken for a little bit of protein if you wanted and make this a full meal. Do you love enjoying fresh spring vegetables once the weather turns warm? What are your favorite picnic recipes? Thanks for sharing this useful post about cooking. All Recipes recently posted…How to make Matcha Tea? Looks delicious. Thanks for sharing at the #InspirationSpotlight party. Pinned & shared.